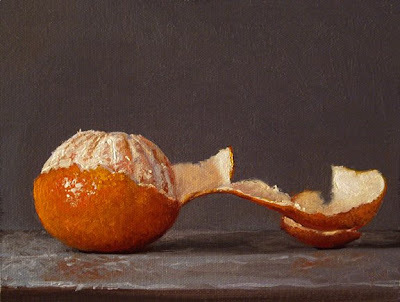 Philadelphia-based artist Abbey Ryan famously paints, posts and lists an oil painting on eBay each weekday; she is now well into the second year of her aptly named Painting a Day Project. Which artists do you admire most? Why? I have diverse interests, but usually I admire artists who follow a focused path. Having recently visited Italy, Giorgio Morandi stands out in my mind right now. 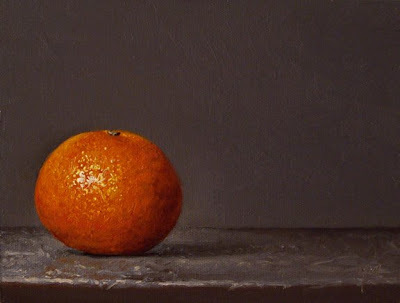 Some of my other current interests are Fantin-Latour, Velasquez, Morris Louis, Anish Kapoor and Johannes Girardoni. What is the most recent exhibition/show you saw? What did you think of it? Who and what are the most important influences on your painting? 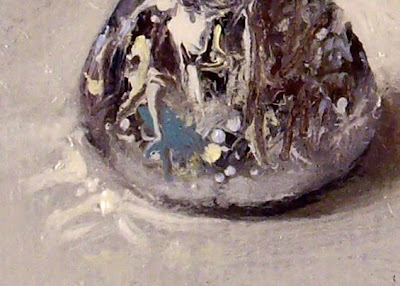 Specifically, my mom (she’s also a painter) has been the biggest influence on my painting work. I feel lucky to have inherited her hands and her ability to see. I also think that the time I spent living and working at a trade school and marine science lab in Pohnpei, Micronesia (in the North Pacific) has greatly impacted my color and spatial sensibilities. In general, my work explores the synergy that leads to a visual experience— how the mind directs the eye in the process of seeing. 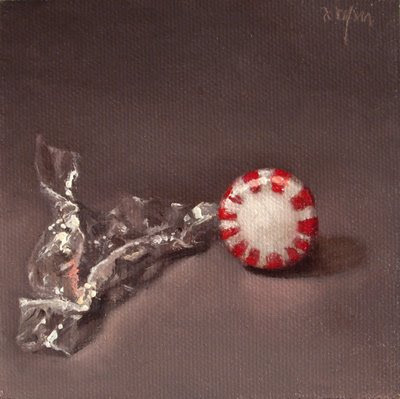 In that way, my paintings avoid specific recognizable references. I’m talking here about my personal work, not my daily paintings. 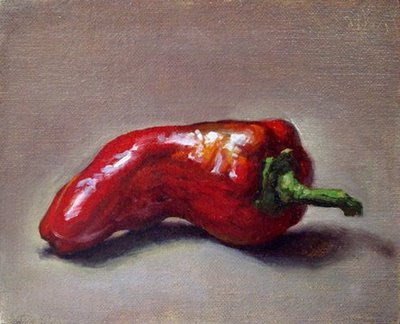 The daily paintings, on the other hand, are prompted by things that catch my eye—whatever fruit or food or objects are around my house. Since my time in Italy, I’ve felt a shift in my daily painting practice, and several people have written or commented to me about this—but I think it’s too soon to really put my finger on it. What type of art do you have in your home? I have a lot of ceramic and wood sculptures, handmade Micronesian crafts, a few of my own paintings, several of my Mom’s paintings, and I’ve started to slowly collect art. At this point, the paintings that I buy or trade with other artists vary a great deal. 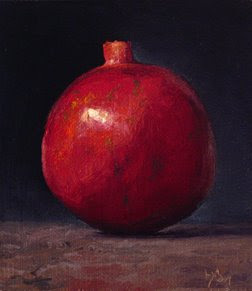 One of my favorite pieces of art is a small painting I have by another teacher I had a Hunter, Gabriele Evertz. It’s a phenomenal piece, definitely one that talks to me all the time. If you could invite six guests (living or dead, real or fictional) to a dinner party, who would they be? 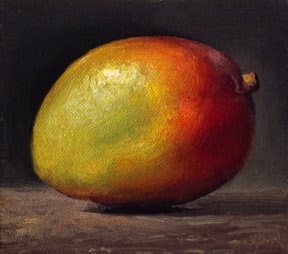 :abbey ryan studio; purchase abbey's paintings through her ebay listing—as of this morning, the beautiful mango and gorgeous pomegranate (images above) were still available. Fascinating project. I always learn something new here. Excellent interview with an excellent artist. Thank you for posting this. 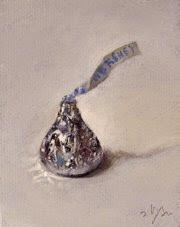 Love that Hershey's kiss and especially the closeup. 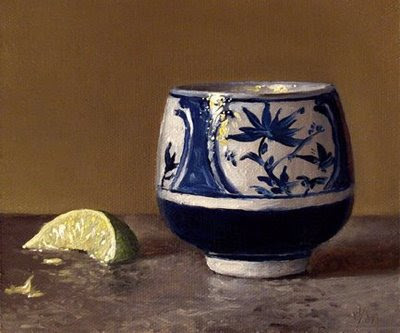 People who can paint like that...wow, I just admire that talent. I'm now a big fan of Abbey's work. She keeps getting better and better. And your interviews are great. Who will be next?